Jeff and Hannah, two division heads from Camp Poyntelle Lewis Village, visited URJ Camp Harlam yesterday, on the first day of a two-part visit. (Today, the delegation also includes a program director and an arts director.) The visit was filled with exciting discoveries both programmatic and logistical, and the CPLV supervisors left with several inspiring ideas! 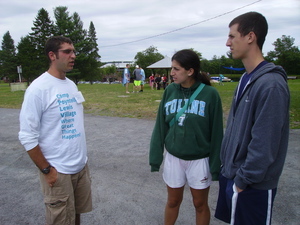 Aaron Selkow, the esteemed director of Camp Harlam, paired each visitor with a Harlam division head for most of the day. As the visitors shadowed their hosts, they got to see supervisor meetings, camper discussions, and a variety of program areas. (Every Shabbat, the visitors learned, Harlam provides professional development opportunities for each of its counselors!) Most importantly, Jeff and Hannah got to observe the basic mechanisms of unit supervision at Harlam, and compare their observations to life at CPLV. Later in the afternoon, the guests met with Harlam's camper care department, and learned about its innovative system for addressing camper issues. Harlam employs four dedicated camper care professionals, including two social workers, who interface with parents, follow up on counselor concerns, and even manage special foods and allergy needs. The CPLV supervisors were so impressed that they asked to take home a copy of the Daily Camper Report form! They also visited the Harlam infirmary, to learn how to streamline and standardize their own infirmary's operations. One of the most exciting parts of the day was Harlam's incredible after-dinner song session (above video). The dining hall erupted with hundreds of campers' joyous singing, led by an enthusiastic (and wirelessly amplified) songleader who wove through the crowd and jumped on tables. 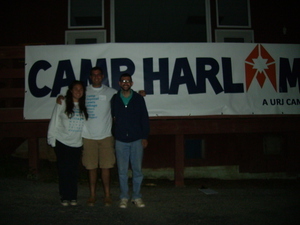 They sang Circle Game, the Hebrew train song, and Summertime Forever, a special camp song written at Harlam in the 90s. 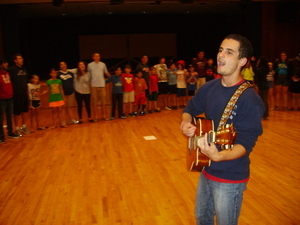 It was the kind of ruach that campers dream about in the off-season, and our host said that it was still only a fraction of the energy found at Harlam's Shabbat song sessions. Personally, I was impressed with the consistency of the Harlam staff's discussion facilitation skills. For the entire day, I saw CITs, counselors, and unit heads across camp facilitate engaging, meaningful, and content-heavy discussions for campers of all ages, while carefully creating a safe and comfortable discussion environment. I can't wait to follow up and find out how that skill is taught in Harlam's staff training, and see if I can adapt it for the organizations where I work. Ultimately, the visit to Camp Harlam was exciting and insightful for the participants from both camps (and for me as well! 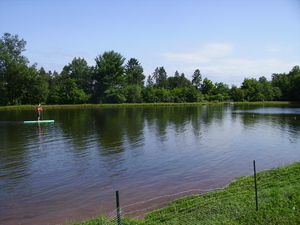 ), and the CPLV supervisors returned home full of new ideas!